The Lion And The Mouse Poem has been taken from one of the best Aesop Fables Stories. Paul King is the writter of the poem who had depicted the whole story in a few words. The origins and history of the poem is still unknown. The poem conveys a great moral lesson to all the children, that is, “A FRIEND IN NEED IS A FRIEND INDEED!” Read, learn and sing along! Also, read Leisure Poem. Along comes a mouse and thinks he’s a hill. Through mane, across ear, and down Lion’s nose. Catches poor Mouse in his long cruel claw. “How dare you walk over your king and your Lord! Tries hard to think how to put things a-right. But he’s now in good humor and lets the mouse go. Who set a great lion-trap cunning and sly. And suddenly finds himself caught in a net. Little Mouse hears how he’s caught in a snare. To the spot where the Lion so rages and roars. Thread after thread, now the Lion feels hope. Soon there’s a hole and the Lion is freed. The Mouse has kept her promise indeed! The poor mouse is now afraid and he thinks how to get out from here. 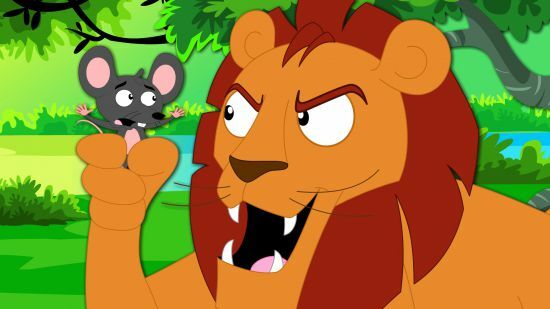 The mouse says, “Please forgive me King, I will surely return this favor of yours!” On hearing this, the lion laughs. But he leaves the little mouse and let him go. Also, read Three Things. Some days later, a few hunters came and targeted the lion as their hunt. The lion is walking, without knowing that the hunters have made an evil plan. Now the lion is caught by them. The lion roars in pain and soon the mouse hears his roars. The mouse remembers its promise and immidiately goes to help its king. As the mouse visits the spot, she starts to bite the thread after thread quickly. Soon, there is a hole and the lion comes out. The little mouse kept his promise and they are now best of friends.